Hockey has become an increasingly popular sport that requires both lateral running and a straight line. Just like soccer or lacrosse, whether you are a field hockey player who prefers indoor hockey or participating in field hockey. Finding the right type of hockey stick and hockey, puck, uniform, shin guards, mouth guard, and shoes to protect your feet are important. However, with different types of shoes to choose from, it can be tricky to decide on the right shoe. Hockey cleats are manufactured for those participating in field hockey and feature metal or plastic studs on the bottom of the shoe, which then provide grip when you’re running over grass. These type of shoes are expensive compared to normal turf shoes. Choosing the right footwear depends on a lot of factors other than price. Buying the wrong hockey cleats could lead to your inability to perform your best, potentially serious injuries, and even aching heels after you’ve played. You need to look at different features to improve your overall fame and consistency in performance. It is terrible to see how people continuously force themselves or their children into shoes that are too big for them. The shoes end up being too uncomfortable to be worn. They also end up wearing out much faster than they would have if they were fitting. Even when the cleats seem perfect, you do not have to force your feet into a size too small. The right fit means that the shoes are not too loose or too tight. When shoes are too tight, you end up getting blisters because they rub on you. Tight shoes also tend to tightly bind your feet which are painful. When shoes are too loose they may fly off or prompt you to change the way you run. This will slow you down and damage your feet and back. As a rule of thumb always ensure that there is an inch of space between your big toe and your second toe to prevent jam and rubbing. Whether you choose a high, low, or mid cleat will depend on your personal preferences. Lacrosse cleats have a higher cleat that goes above your ankle. This gives you better support. Low cleats, on the other hand, stop at your ankle and allow you to have more flexibility. If you struggle with ankle injuries, you will find that high cleats will offer you better support and keep your ankle safe. Mid cleats are somewhere between support and flexibility. If you do not want the high-top feeling but still need some extra protection, mid cleats are what you should be looking for. Low cleats are, however, the lightest because they use the least material if you feel that you need to run faster, these are perfect. It never hurts to have a couple of pairs for the days you feel you need something different in the field. Before you settle for a cleat, you need to research on the materials used to make the shoes. In the past, hockey cleats were made from high-quality materials that were found naturally. Today, technological advances have allowed manufacturers to experiment more with the materials they use to make their hockey cleats. The material used to make the cleat needs to be lightweight and waterproof. The last thing you want is for your feet to get wet as you play out there in the snow. Not only is this uncomfortable, it could also cause health issues like arthritis. Lightweight materials help protect your back and allow you to run faster and slow down easily. You are not going to wear the shoes for just one season. Nobody likes cleats that rip halfway through the season. It is therefore critical to ensure that your cleats can keep up with your game. The trick is to ensure that you cannot bend the cleat in half even if you used all your strength. This assures you that the sole is solidly built and can take a lot of abuse before it crumbles. If the sole crumbles, you will also face the problem of sore feet halfway through a game. Cleats with reinforced shoelace holes are also better because they keep you from ripping them out after tightening your shoelaces frequently. If you’re on the lookout for quality hockey cleats, here are some top picks. Made from rubber sole and a synthetic upper material, these hockey cleats are not only of great quality, they are also durable. Find some integrated mesh for added comfort. With the insole being removable, you can easily clean the shoe without worrying that you’ll damage it. 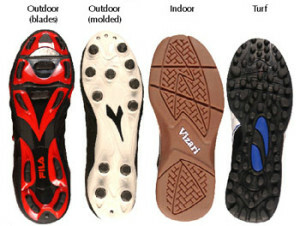 Also, the shoes have a firm sole which provides you with excellent stability while on the field running. Perfectly designed for men playing outdoor, the Warrior Lacrosse cleat is sleek and boasts of a combination of black and white. The thermoplastic polyurethane and synthetic sole are included providing comfort and longevity. What’s more, these cleats offer high flexibility and great traction during the run. Being an upgraded field hockey shoe, this shoe is designed to endure punches and hits, making it one of the most comfortable shoes around. Featuring a rugged design and style, these shoes provide better traction, perfect for both beginners and proficient players. Moreover, these shoes have a heat-reflecting layer which provides comfort as well as keeping your feet warm after an intense play. The SPRINTFRAME technology and grippy outsoles make the Adidas Dox shoe a must have. Whether you’re looking for a better strategy, comfort, or sweat-wicking performance, these shoes have got it all. Featuring a longer neck than your ordinary shoes, these MC Cleats have a unique design and are made from synthetic material. Equipped with V56 technology, the hockey cleats are a smarter choice for many users. This shoe is designed specifically for lacrosse, the balance between weight and strength is absolutely perfect for players cutting on a dime without feeling the backseats of more restrictive and bulky shoes. At the bottom, it has a nubby turf that provides traction and protects you from sinking into deep turf itself. The shoe is designed with a synthetic sole and upper with an outer layer that is water resistant to ensure your foot is protected from snow and rain. If your game includes being on turf exclusively, then this is the cleat for you. Want to advance the level of your game as an adult older player, then it’s time you give a try to a cleat that will deliver just that for you. The Under Armour UA Highlight MC is made of synthetic material that gives you the flexibility of lateral movements, sharp cuts, and support while running. On the footbed, it’s designed to generate optimal cushioning for your foot thanks to the 4D form that molds around the foot. The shoe is cooler and comfortable with the improvising technology of V56 to ensure you toe is protected from all forms of injuries including turf toe. Nike Vapor SpeedLax is the only cleat you will find on the market that has it all. The cleat comes with a variety of colors; therefore, making it easy to find the ideal color that matches your club wear. Additionally, the cleat comes with a fit sleeve that covers your midfoot for a perfect grip while cutting and running. It’s made of a synthetic leather material that is sturdy and supportive. The lightweight design makes the cleat a true and reliable partner for all time lacrosse players. The reduction of bulky weight also improves on your speed while at the field. If your main focus while in the field is comfort and protecting your foot with a shoe that is supportive and flexible, then look no further. Nike Huarache V-Lax is specifically designed for durability and comfort throughout the seasons. It’s made of a lightweight leather material that guarantees you high speed and stamina. The cleat is made with an impressive and improved technology of Flywire for additional support and lockdown. It has a super low profile for optimal responsiveness and feel of the forefoot and a Phylon midsole for support and cushioning in the midfoot for protection. Choosing the right cleats will depend on what features you want and how much you are willing to pay to get the right shoes. It also depends on how much speed and comfort you need during a game.